The shares slumped -6.88% after dropping as much as -10% at the lows after the company’s CEO, in an interview with CNBC yesterday, failed to reassure market fears about a weakening financial position. The CEO suggested that the company will now urgently sell assets to address leverage and its precarious liquidity situation whereby it will have to rely on revolvers - and the generosity of its banks - now that it is locked out of the commercial paper market. Indeed, shares hit levels first seen in 1995 yesterday and have only been lower since, very briefly, during the financial crisis when they hit $6.66 in March 2009. For a bit of perspective, Deutsche Bank notes that the market cap of GE now is $69.5bn and it’s the 80th largest company in the S&P 500. Yet in August 2003, GE was the largest company in the index (and regularly the world between 1993-2005) at a market cap of $296bn, $12bn more than Microsoft in second place. Since then, the tech giant has grown to be a $826bn company well over 10 times the size, while GE’s market cap peaked (ironically) during the dot com bubble in August 2000 at $594BN before tumbling first in the tech crash and then the GFC. But while most investors have been focusing on GE's sliding equity, the bigger concern is what happens to the company's giant debt load, especially if it is downgraded to junk. First, some background: GE had about $115 billion of debt outstanding as of the end of September, down from $136 billion a year earlier. And while GE is targeting a net EBITDA leverage ratio of 2.5x, this hasn’t been enough to appease credit raters, which have expressed concern recently that GE’s beleaguered power business and deteriorating cash flows will continue to weaken the company’s financial position. As a result, Moody’s downgraded GE two levels last month to Baa1, three steps above speculative grade. S&P Global Ratings and Fitch Ratings assign the company an equivalent BBB+, all with stable outlooks. The problem is that while the rating agencies still hold GE as an investment grade company, the market disagrees. GE - a top 15 issuer in both the US and EU indices - was recently downgraded into the BBB bucket, and as recently as September it was trading 20bps inside BBB- bonds. However they crossed over at the end of that month and now trade up to 50bps wide to the average of the weakest notch of IG. In other words, GE is already trading like junk, and has become the proverbial canary in the coalmine for what many have said could be the biggest risk facing the bond market: over $1 trillion in potential "fallen angel" debt, or investment grade names that end up being downgraded to high yield, resulting in a junk bond crisis. As Deutsche Bank's Jim Reid notes, GE's recent collapse has come at time when much discussion in recent months has been about BBBs as a percentage of the size of the HY market. Since 2005, BBBs have been steadily rising as a percentage of HY climbing back above the previous peak in 2014 (175%) before extending that growth to a current level of 274%. Meanwhile, the total notional of BBB investment grade debt has grown to $2.5 trillion in par value today, a 227% increase since 2009, and now represents 50% of the entire IG index. Next, to get a sense of just how large the risk of fallen angels in the US is, consider that the BBB part of the IG index is now ~2.5x as large as the entire HY index. So large BBB companies - and none are larger than GE - with a deteriorating credit story are prone to additional widening pressure as investors fear the risks of an eventual downgrade to HY and a swamping of paper into that market. This, as Deutsche Bank writes, isn’t helping GE at the moment and may be a dress rehearsal for what happens for weaker and large BBB issuers in the next recession. Meanwhile, while GE is not trading as a pure play junk bond just yet, it is well on its way as the following chart of GE's spread in the context of both IG and HY shows. Which is both sad, and ironic: as Bloomberg's Sebastian Boyd writes this morning, "the company's CEOs boasted of its AAA rating as a key strategic asset, but it was more than that. The rating, which it maintained for more than half a century, was symbolic of the company's status as a champion of American commerce. Now, Microsoft and Johnson & Johnson are the only U.S. corporates with the top rating from S&P." And while rating agencies have yet to indicate they are contemplating further cuts to the company's investment grade rating, the bond market has clearly awoken, and nowhere more so than in the swap space, where GE's Credit Default Swaps have exploded in recent weeks. 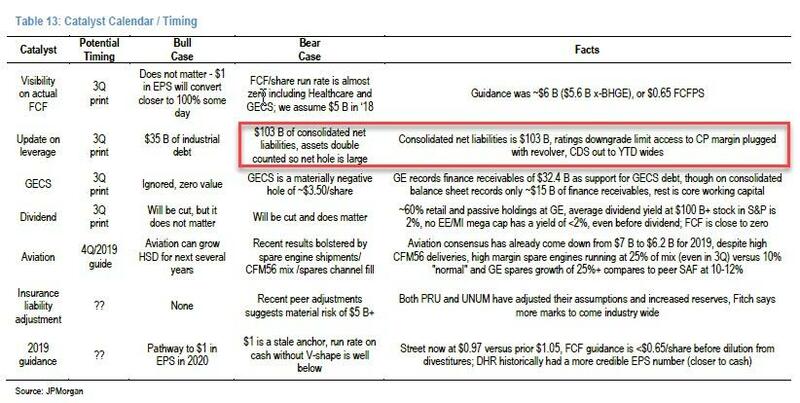 What kind of an impact would GE's downgrade have? 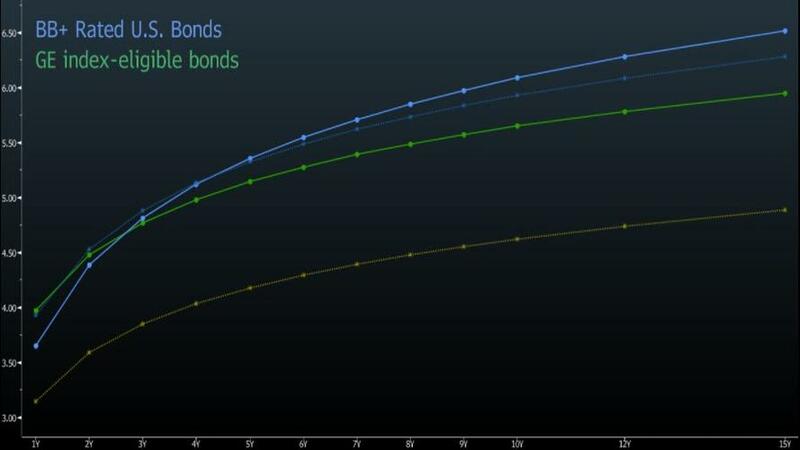 With $48 billion of bonds in the Bloomberg Barclays US Corporate index, GE would become almost 9% of the BB universe. 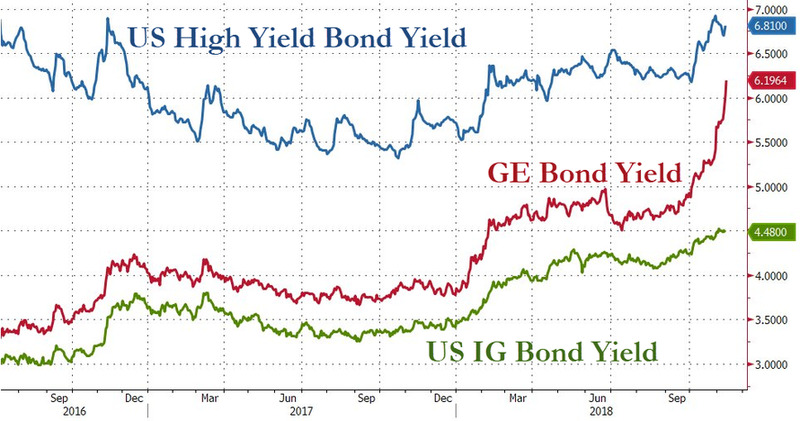 And one look at Boyd's chart below shows that the market is increasingly pricing GE's index-eligible bonds as junk, especially in the context of the move over the past month. 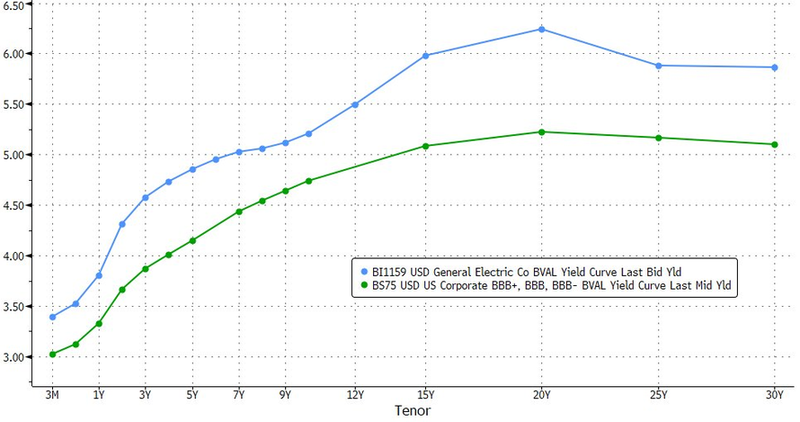 An additional risk to the company's credit profile: GE has more debt coming due in the next 18 months than any other BBB rated borrower: that fact alone makes it the most exposed to higher rates according to Boyd. Meanwhile, GE's ongoing spread blow out, and junk-equivalent price, has not escaped unnoticed, and as we have been warning for a while, could portend a broader repricing in the credit sector. As Guggenheim CIO commented this morning, "the selloff in GE is not an isolated event. More investment grade credits to follow. The slide and collapse in investment grade debt has begun." Then again, Minerd's concern pales in comparison to what some other credit strategists. In an interview with Bloomberg TV on November 8, Bruce Richards, chairman and chief executive officer of the multi-billion Marathon Asset Management warned that overleveraged companies "are going to get crushed" in the next recession. Richards also warned that when the cycle does turn, "with no liquidity in the high-yield market to speak of, when these tens of billions or potentially hundreds of billions falls into junk land, it’s "Watch out below!" because there’s going to be enormous price adjustments." 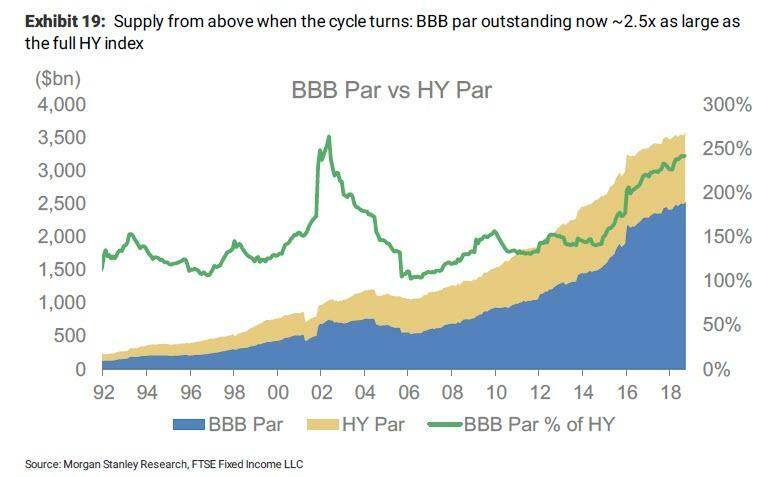 Echoing what we said above, Richards noted that about $1 trillion of bonds are rated as BBB, as investment- grade, when they has leverage ratios worthy of junk, adding that "the magnifying glass is now shifting" toward ratings companies. For now the "magnifying glass" appears to have focused on GE, and judging by the blow out in spreads for this "investment grade" credit, what it has found has been unexpected. Which brings us to the question we asked at the top: will GE be the canary in the credit crisis coalmine and, when the next crisis finally does strike, the biggest fallen angel of them all?